No matter what you are shopping for it’s always good to compare prices before you buy. Knowing what a good price is can help you save money. 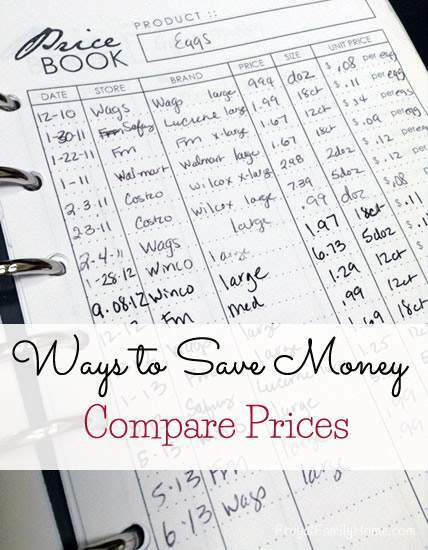 I know comparing prices is one of the ways to save money, I use often. Whether I’m buying groceries or a big-ticket item like a washing machine I like, no love to shop around. Once you know what the price is at Amazon you can search for other websites that might have a better price. I get my water filters for the refrigerator this way and many other items. Just taking a few minutes to search can save you a bunch. I use a price book to track prices of groceries that I purchase most often. I have found in my area if I purchase flour at Winco Foods I can save $.52 for each 5 pound bag of unbleached flour I buy. I usually use about 30 pounds a month so that saves us $3.12 a month for just that one item. Meat is another item to track. I recently found ground beef on sale for $1.99 per pound. I knew it was a great buy, since in the last 8 months the best price was $2.49 per pound. I ended up purchasing 20 pounds saving $10 on that one purchase. Now I have ground beef for a while in my freezer. 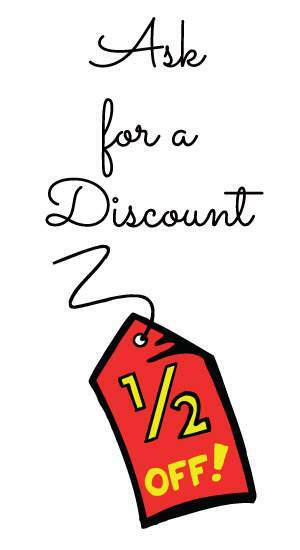 Whenever you are shopping ask for a discount. The worst the salesperson will say is “sorry that’s the best price we can do.” and you haven’t lost anything. This past week I got a renewal notice for my small local paper. The price was double the price when I first signed up. I wanted to see if I could get a better price so I made a phone call. The person at the paper let me know to watch for coupons in the paper. She let me know that once a month they published coupons in the paper for the paper. She also let me know all I needed to do was clip the coupon and add it to my bill and I could receive the discount. I thought it was only for new subscribers, but I was wrong. So I was able to save 50% on my paper subscription. We bought a new to us, used car this past year. When we added our new car to our insurance policy the price was a good price for the coverage. Then we deleted the old car, since we sold it, and the price for the new car policy went up. I gave my agent a call to ask her why. She let me know she would try making us a new policy. She said when the companies issue a new policy you can often get a better discount. Well, she was right, it saved us $400 a year on our cars we insure. I also heard on the Clark Howard Show that companies don’t reward people for being loyal customers but give the best breaks to new customers. So it’s best to shop around regularly to get the best price. On things you automatically renew, such as insurance, cable, cell phone service and internet. You could be paying much more than you need to. If you have a home phone or cable you can also ask for a tariff rate. It’s a special rate that the company often won’t tell you about for their basic service. So if you just need the basic package be sure to ask what the tariff rate is. Do you like to shop around to save? I have never heard of a tariff rate. What is that? We can only get time warner cable in this area for internet. I call every few months to see if we can get a better rate. I actually should do that again. Thanks for all the tips! A tariff rate is a low rate for basic service. It’s a rate they won’t tell you about unless you ask. I know they have them for phone service and I believe for cable television too. I don’t think there is a tariff rate for internet service. You would have to ask. I’m hoping we get Google internet service here. It looks like they might be coming into our area soon.